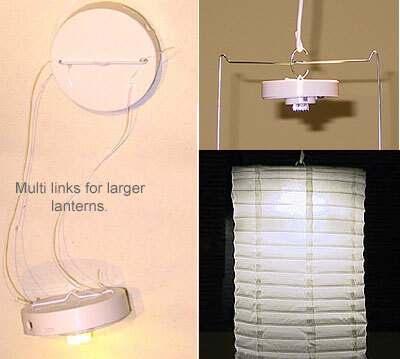 The brightest LED battery terminals for paper lanterns on the web. Each LED battery terminal contains 6 LED Warm-Bright-Burst type bulbs that illuminate Tru-color. Offers over 22 hours of lighting on one set of batteries, and has a rated life of 10,000 hours. Requires three AAA alkaline batteries (not included). It may be used with all sizes of Shoji Decor’s paper lanterns. Multiple terminals may be used for larger lanterns or for extra lighting. It is hassle free and simple to use. No cords required. Shoji Decor Exclusive.